Okay…I know I already have like 5 banana bread recipes on my blog, but one is our favorite of all time, and I am not just saying that!!! The ground cinnamon addition adds a delectable flavor to this bread that is absolutely spectacular! 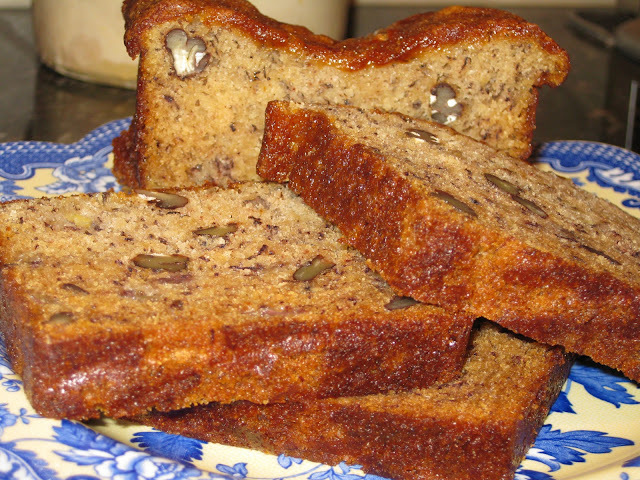 My mom made this bread at her house and I had a slice three days later and it was still the moistest banana bread I have ever tasted. 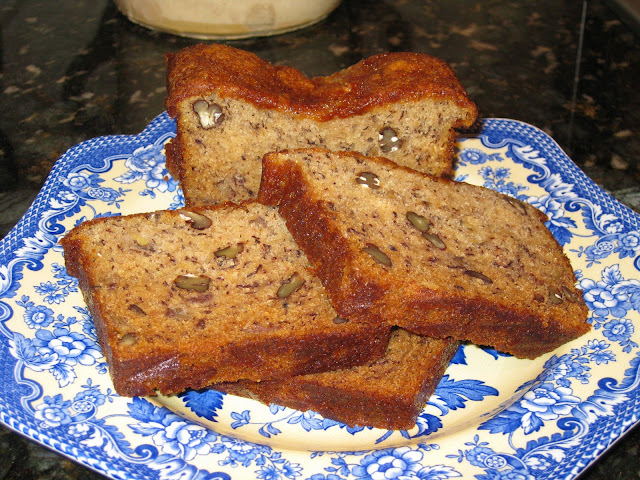 I insist you try this banana bread recipe and add it to your favorites! The recipe comes from Joanne Chang’s cookbook called, “Flour: Spectacular Recipes from Boston’s Flour Bakery + Cafe”. Enjoy! Preheat oven to 325 degrees. Butter a 9 x 5 inch pan. Using a stand mixer fitted with the whip attachment, beat together the sugar and eggs on medium speed for 5 minutes. On low speed slowly drizzle in the oil. Don't pour the oil in all at once. Add it slowly so it has time to incorporate into the eggs and doesn't deflate the air you have just beaten into the batter. Adding it should take about 1 minute. Add the bananas, sour cream, and vanilla and continue to mix on low speed until just combined. Using a rubber spatula, fold in the flour mixture and the nuts just until thoroughly combined. Pour the batter into the prepared pan and smooth the top. Bake for 1 to 1 hour and 15 minutes or until golden brown on top and the center springs back when you press it. Let it cool in the pan on a wire rack for at least 30 minutes, and then pop it out of the pan to finish cooling. 2 Responses to "Flour’s Famous Banana Bread"
I’ve made this several times and it’s perfectly moist and always delicious. That’s great! Glad you liked it and I hope you’re doing well!